Gear abilities, or simply abilities, are special attributes that are placed on wearable gear in Splatoon and Splatoon 2. They provide different effects depending on the ability present and their strength is based around the number of copies if they are stackable. Each piece of gear has a specific primary ability (also called main) which cannot be changed. In Splatoon, each piece of gear has a set primary ability which never varies. In Splatoon 2, some gear (namely, gear obtained through Salmon Run) does not have a default primary ability and instead gets a random one generated from all the abilities available for that type of gear. In addition, all the starting gear and all the gear normally purchasable in shops regularly appears on the SplatNet 2 shop with different abilities than the normal ones. By default, no gear in Splatoon or Splatoon 2 has a primary ability that matches the secondary ability favored by the brand that produces it. This is done to make acquiring gear with all 4 slots having the same ability (colloquially called "pure" gear) more difficult. However, SplatNet 2 gear is sometimes sold with a matching ability. Because the Splatfest Tee has to be worn during Splatfest, every player will use the same clothing ability during Splatfest Battles. All gear has 1-3 slots for secondary abilities (also called subs), which are weaker versions of the non-exclusive primary abilities. The effect is exactly three-tenths of a primary ability. The number of secondary abilities that can be present on a single piece of gear depends on the rarity (amount of stars) of the gear. The more stars there are, the more secondary abilities slots it comes with. Up to three secondary abilities can be present, meaning that the highest rarity is 3 stars. Secondary abilities are randomly chosen whenever a gear levels up, which happens when its bar is filled through battling. The points earned in matches go towards leveling it up. Higher rarity pieces of gear take more points to level up, even on the first slot, and each progressive slot on the same gear requires a larger amount of points. Subs are rolled using random number generation (RNG). There are 13 possible secondary abilities in Splatoon and 14 in Splatoon 2. Many brands make getting specific abilities either more common or less common. Brands that affect roll probability have a 5× chance of rolling a favored ability, and a 1/2× chance of rolling an unfavored ability. In Splatoon, this means there is a 2/33 chance of rolling each of the 11 neutral abilities, a 1/33 chance of rolling the one unfavored ability, and a 10/33 chance of rolling the one favored ability. Brands that do not affect roll probability have a 1/13 chance of rolling each of the 13 abilities. In Splatoon 2, this means there is a 2/35 chance of rolling each of the 12 neutral abilities, a 1/35 chance of rolling the one unfavored ability, and a 10/35 chance of rolling the one favored ability. Brands that do not affect roll probability have a 1/14 chance of rolling each of the 14 abilities. In Splatoon 2, an ability's likelihood can be influenced with a drink ticket. Doing so will give the corresponding ability a 30% chance of being rolled, with all other abilities retaining their relative likelihoods within the remaining 70%. An overview of a few stackable abilities in Splatoon 2. Note the diminishing returns as more of the same ability is used. Stacked abilities have diminishing returns, meaning that each additional ability of the same type will have a slightly smaller effect than the previous. Diminishing returns make it impossible for players to gain over-powered stats, and make it undesirable to stack too much of the same ability. Diminishing returns may be more noticeable on some abilities than on others; abilities that have a small maximum effect or a small base stat being modified may feel especially ineffective to stack. For example, Swim Speed Up has a small maximum effect of 25%, so diminishing returns may seem severe relative to the other abilities. A player may not even perceive an improvement past a certain point, like after 3 main ability slots of Swim Speed Up. This encourages players to wear a variety of different abilities, rather than focusing on one ability. Spyke, who can be found in an alleyway in Inkopolis Plaza, will offer to re-roll secondary abilities or increase the gear's slots in exchange for a Super Sea Snail or 30,000 cash. In Splatoon, some abilities are ineffective with certain sub weapons and special weapons, offering no improvements. Bomb Range Up has no effect on non-throwable sub weapons: the Ink Mine, the Seeker, the Splash Wall, and the Squid Beakon. It also provides no improvement for one throwable weapon, the Sprinkler. Damage Up offers no further improvements after it causes a weapon to reach its damage cap. Run Speed Up has no effect on the run speed while pushing a roller. Quick Respawn has no effect on respawn time after drowning or falling, unless the player uses more than four secondary slots' worth of the ability. Use Ability Chunks Places a specific ability in a specific slot on gear. The target slot must be unlocked, but can be occupied. If an occupied slot is overwritten, one ability chunk of the removed ability will be provided.The price depends on the number of the same secondary ability already present on the gear. The primary ability is not counted for this calculation. All existing gear slots and ability chunks for Bomb Defense Up and Cold-Blooded were replaced with Bomb Defense Up DX. Gear items available in Ye Olde Cloth Shoppe that had Cold-Blooded as the main ability now offer Main Power Up as the main ability instead. 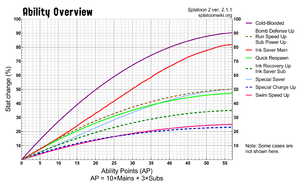 Diagram of abilities and brands in Splatoon, which brand favors and not favors each ability. Promo image of the abilities in Splatoon 2. This page was last edited on 26 March 2019, at 20:16. This page has been accessed 482,837 times.